Speaking & Teaching – Lois Abromitis Mackin, Ph.D.
Genealogy 101 (available as one-hour, half-day, full-day, or multi-session workshops)–This presentation describes five steps for beginning and continuing your genealogical research (write down and organize what you know, decide what you want to learn, locate a useful source, learn from the source, and use what you learned). Topics include how and where to research on the Internet as well as in libraries and archives and essential genealogical sources for beginners (census, vital records, church and cemetery records, passenger lists, and naturalization records). Beginning English Genealogy (one hour)–This presentation discusses the similarities and differences between American and English research, describes English census, civil registration, and church records, and gives a overview of useful websites. 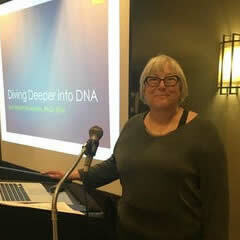 Becoming an Intermediate Genealogist: Expanding Your Skills and Repertoire (one hour or 90 minutes)—This presentation explores the mindset and skills that beginning genealogists and family historians need to develop in order to expand their capabilities as researchers. Organizing (one hour or 90 minutes)–One of Lois’ favorite topics! Can you find any genealogical item in your collection—paper or electronic—in less than five minutes? If not, ask Lois for help! Review organizing options and ideas, follow organizing steps, watch genealogy makeovers, and learn the habits that will keep you organized. Planning Your Research (one hour or 90 minutes)—The old adage “Failing to plan means planning to fail” applies in genealogy as in other areas. This presentation shows you how to narrow broad research objectives into targeted, achievable research plans. Learn the elements you need to include in order to make your research plans into roadmaps to success. Many Paths, One Goal (one hour or 90 minutes)—Genealogical research is a process. Like all processes, it involves a series of sequential steps, but, unlike some processes, the steps don’t always need to occur in the same order. This lecture presents several different sequences of research steps for a family history problem, and illustrates how all ultimately arrive at success, showing how, in genealogy, there are many paths to one goal. Citations Without Pain (one hour or 90 minutes)—Does crafting citations for your genealogical sources baffle, befuddle, bewilder, perplex, or perturb you? Do you wish you had never heard of Evidence Explained? Learn how to approach your citations in a clear-minded, methodical, ordered way so that you become composed, calm, and Zen-like when you write. Troubleshooting Your Problem Solving (one hour)—Ever have a problem that defies your attempts to solve it? Maybe the problem’s not the problem! This session walks through tools for goal-setting and problem formulation, collecting and analyzing evidence, and stating your conclusion that will help you raise your problem-solving success rate. When You Need Help With Your Research (one hour)—Every genealogist encounters situations where they may not have the time, the access to records, or the local knowledge to solve a genealogical problem. This talk examines ways you can find help from libraries, state and local historical and genealogical societies, and professional researchers, and what you need to do in order to get the most out of these resources. Finding Your Female Ancestors (one hour)—Most genealogists and family historians have gaps in their knowledge of the female half of their family. We’ll talk about the challenges researchers face in learning about women, review helpful documents and sources, and look at how to use DNA to find hidden ancestors. Using Spreadsheets for Genealogical Research (one hour)—Census research shows movement and change in individuals and families over time and provides pointers to other types of records. Spreadsheets are a wonderful way to summarize your census research, both for individuals and for whole families. Learn how to use them to track migrations and other transitions shown in federal, state, and international census records. Using Timelines in Your Research (one hour)—Timelines (chronologies of events in the lives of your ancestral families) are a terrific genealogical tool. Not only can they help you solve problems and identify holes in your research, they can help you get ready to write up and share your findings. Tools for Analyzing and Correlating Genealogical Evidence (one hour)—Analysis and correlation of evidence is an important part of meeting the Genealogical Proof Standard. This talk demonstrates a variety of organizational tools any genealogist can use for analyzing and correlating evidence, including tables, maps, spreadsheets, diagrams, and more. Grandpa’s Probate Solves the Case of the Disappearing Daughters (one hour)—The five daughters of James M. Galt progressively disappeared from the family home. Two reappeared on a memorial stone. Did they marry, die, or both? 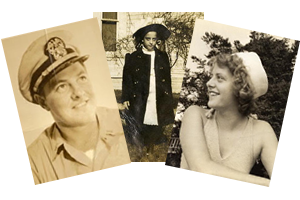 This case shows how researching collateral relatives—in this case, the girls’ maternal grandfather–can help you solve genealogical problems. The Case of Rob Leedle: Yorkshire to Wisconsin, Iowa, Minnesota, North Dakota, and Canada (one hour or 90 minutes)—This case study illustrates how genealogists use expanding circles of people, places, and sources to uncover the stories of their research subjects. Rob Leedle was born in Yorkshire, emigrated to Wisconsin, moved on to Iowa, Minnesota, and North Dakota, and died in Canada. Sources for Rob’s story include English, American, and Canadian church records, vital records, census records, military records, passenger and border crossing lists, naturalization records, county histories, and land records. Tracing the Trewrens: an English Migration Study (one hour or 90 minutes)—In the 1800s, the bottom fell out of the mining economy in Cornwall, pushing many Cornish people to emigrate. The family of George Trewren and Mary Glasson of Ludgvan provides a case study of the diaspora, utilizing vital records, census records, passenger lists, voter lists, cemetery records, newspapers, and probates to trace family members from England to the U.S., Australia, and South Africa. Exploring FamilySearch (one hour or 90 minutes)—This presentation shows researchers how to get the most of the records, family histories, e-books, and learning resources on FamilySearch. Exploring Ancestry (one hour)—This presentation explores the major features of the Ancestry website–records, trees, DNA, and learning resources. English Research on the Internet (one hour)—This presentation provides a tour of key websites for researching English ancestors. Included are Ancestry, Findmypast, FamilySearch, The National Archives, Vision of Britain, GENUKI, and more. Using the Online Resources of the DAR for Your Genealogy (one hour)—The Daughters of the American Revolution’s online Genealogical Research System is a premier resource for researching Revolutionary ancestors, where you’re interested in DAR membership or not. Learn what’s available and how you can use it to enhance your research. Vital Records (one hour or 90 minutes)—Dates and places of births, marriages, and deaths are the “meat and potatoes” of our genealogical research. Learn how to find the facts in local, state, and even federal government records. Census Research (one hour or 90 minutes)—Lois gives several talks on American census records and how to use them. Topics include population and non-population schedules of the federal census as well as state census. All talks provide an overview of the census records and what they contain, show where to find them on line and in repositories, and discuss how to get the most out of them for your research. Church and Cemetery Records (one hour, 90 minutes, or two one-hour sessions)—Before civil governments kept birth, marriage, and death records, churches and cemeteries did—in writing and in wood or stone. Learn what you can find about your ancestors in the records of their churches and cemeteries, and how to locate these materials. Finding Military Records in All the Right Places (one hour)—From the American Revolution to Iraq and Afganistan, Americans have served in the military, creating a treasure trove of records for family historians. Learn how to access these records from the National Archives and online through fold3.com. Twentieth-Century Military Records (one hour)—Did you or your twentieth-century ancestors serve in World War I, World War II, Korea, or Vietnam? This lecture discusses information you can find in the records of these conflicts and how to obtain copies of official military personnel files. Finding Overseas Ancestors (one hour)—Most of our ancestors came here from overseas, and often we don’t know their place of origin. This talk shows how to find your ancestor’s village or place of origin in American records, including emigration and immigration passenger lists and naturalization records. Using City Directories to Find Family and Solve Research Problems (one hour)—These resources, increasingly available online, help you find family members between censuses, track movements and migrations, learn about ancestral residences and occupations, and explore changes in your families. Learn how to find directories, work with the information you find in them, and use them to solve your research problems. Working with Probate Records (one hour)—Probate records are a great way to trace property, reconstruct families, and link generations. Learn about the principal kinds of probate records, the information you can find in them, where to locate them, and how to work with original probate records as well as the online probate collections at Ancestry and FamilySearch. Now That You’ve Tested (one hour)–This session shows how to get the most out of your autosomal DNA test results! We will talk about setting up your profiles, understanding your match lists, working with analytical tools, prioritizing your DNA research, and working with your matches. We will also review the ethical considerations involved in DNA research. Diving Deeper into DNA (one hour or 90 minutes)—This session briefly reviews DNA basics (ethics, tests, and testing companies) and covers how to be a smart tester by defining your objective, making a plan, choosing tests, identifying test subjects, and maximizing your investment. It uses case studies showing how to understand and analyze test results using tools from testing companies and third-party sites. Tools for Working with Autosomal DNA Results (one hour)–This session reviews tools and techniques for moving beyond testing company relationship predictions and working with your matches. It provides an overview of building genetic networks by using shared matches/in common with results, working with your matches’ trees, using chromosome browsers, and analyzing shared segments. Third-Party Tools: What They Are and Why You Should Know About Them (one hour)—Today’s genetic genealogists test at one, two, three, or more testing companies, accumulating matches at each testing company. On- and offline tools created by developers independent of the testing companies (third-party tools) offer a way to consolidate matches and analyze data across testing companies. This session focuses primarily on GEDmatch, but will also provide a taste of other tools, including DNAPainter. Who Was Cousin John? (one hour)–This session is a DNA case study that uses autosomal DNA testing, in combination with documentary research, to discover the relationship of a “mystery man” to a known family group. It illustrates how to work with DNA tests at different companies, and how to use autosomal tools to interpret results. X-Chromosome DNA (one hour)—This session explores X-chromosome DNA: how it’s inherited and how you can use X-chromosome matches to explore your family history. Best suited for audiences that have tested their DNA and learned how to use tools provided by testing companies and third-party sites for working with their matches. Researching When You’re Not There (one hour)—Some lucky genealogists live near the locations where their ancestors lived, but most do not! If you’re one of those who don’t, this session will help you learn about the locations your ancestors inhabited and conduct research there from a distance. Planning a Genealogy Research Trip (one hour or 90 minutes)—Genealogy research trips are exhilarating, fun, and rewarding. Learn tips and tricks to make your trip successful. Lois will talk about planning and preparation, as well as technology to help you on the road and in your research locations. Don’t Cross the Pond Till You’re Ready (one hour or 90 minutes)—Overseas research starts in the U.S.! Learn how to use the Genealogical Proof Standard to locate, analyze, and correlate the American records that identify your ancestor’s overseas place of origin. Learning about Localities: How to Research New States and Counties (one hour or 90 minutes)—Every genealogist encounters the need to research unfamiliar places sooner or later. This talk will help you get up to speed quickly in new locations so that you can find the state, county, and town sources you need to research effectively. Researching in Pennsylvania (one hour)—Lois’ ancestors are mostly from Pennsylvania, and she has researched in many Pennsylvania counties. Learn the peculiarities and rewards of Pennsylvania research. Let’s Talk Lineage–Societies You Can Join (one hour)—Do you have ancestors who sailed on the Mayflower? Fought in the American Revolution, the War of 1812, or the Civil War? Were they early settlers of Virginia, Wisconsin, Minnesota, or other states? Learn about hereditary and lineage associations you and your family members may be eligible to join, and walk through the process of preparing an application. So You’ve Been Asked to Teach a Class or Course… (one hour)—What do you do when you’re asked to teach a genealogy class or course? This talk leads you through the steps of designing and delivering genealogy education. It will help you define your target audience and overall purpose, create learning objectives and teaching strategies, and develop instructional materials, including slides, exercises, and handouts. It will also provide tips for delivering and evaluating your class or course.